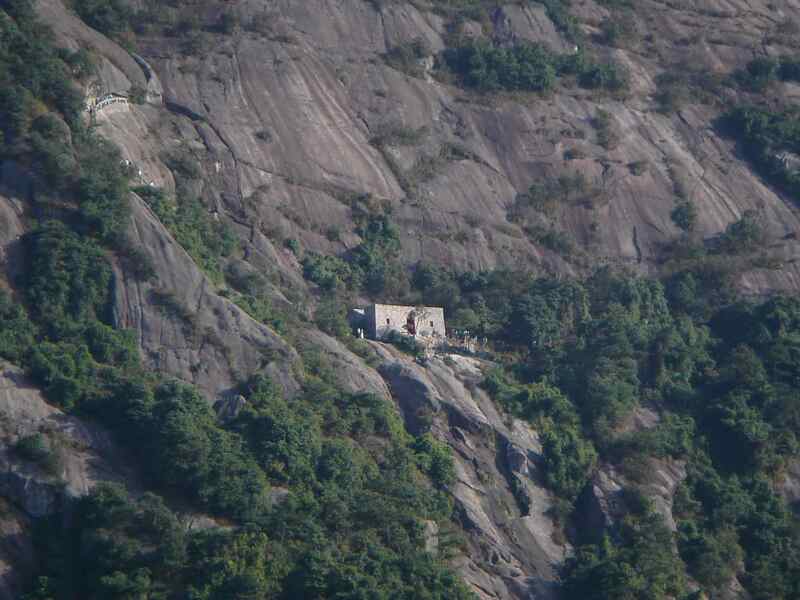 A tiny temple on the side of a mountain in Fuzhou. Every hill or mountain we went to seemed to have some kind of temple installed. For a melancholic the appeal of mysticism is obvious: just a glimmer of transcendence is enough to inspire our idealist inclinations to follow what one old mystic, the Benedictine/Swami Bede Griffiths called ‘the golden string’. For a melancholic it makes perfect sense to put ‘ultimate reality’ ahead of the mundane one, to sell everything for the sake of the pearl of great price. But from a more worldly perspective it makes no sense to be uselessly sitting quietly, seemingly inert, inactive, and unproductive. In fact, while mysticism is a struggle in its own right, from the very beginning the path is entirely opposed to most of the things that are supposed to make ordinary life enjoyable and meaningful. The heart of mysticism is, after all, to recollect and redirect your many and varied desires for worldly things back to the one thing that supersedes the world. We are, from a worldly perspective, supposed to spend our free time playing with our mobile phones, buying apps and viewing ads. From this point of view mysticism is worse than useless. It can’t be shared, it can’t be bought or sold, and in a strange inversion it even rebukes us silently for the time and energy we waste on truly meaningless vanities. The paradox of mysticism is that it is useless from a worldly perspective, yet reveals in turn the vanity of the world. Despite the difficulty of the path, it reveals from an early stage that our cares and worries and preoccupations are nothing but dust and straw. Many have compared it to waking from a dream, or seeing clearly for the first time. Its merits are hard to fathom because we are so used to judging merit by worldly standards. Even climbing a mountain and enjoying the view can be packaged as an ‘experience’, bought and sold, shared and bragged about, measured in mundane terms. What cannot be measured, assessed, described or shared is the emptiness of mysticism, its silence and humility. What this means is that one can fulfill the ideal of human life while doing ‘nothing’ by worldly standards. It means that the endless struggle, striving, craving and distraction of human life is not the final word. To know the finality, the telos, of one’s existence is far beyond being useful, valuable, or meritorious; instead it recasts and reshapes the entire landscape of use, value, and merit. Thus a practice which the world has cast aside nonetheless stands in rebuke of worldliness and prevails. One of the first attractions of philosophy was that it offered a deeper understanding. It may not have promised answers, but some things are too big for questions and answers, and philosophy was the one discipline that allowed no limitations on its inquiry. I took for granted that a deep understanding was superior to a shallow one; that a considered answer would always trump an ill-considered response. But it turns out that there are realms where a shallow understanding is more than sufficient, and an ill-considered response is by no means disadvantageous. It is possible because regardless of the merits of depth, it has the following drawbacks: depth is slow, depth is cautious, depth is elitist. Depth is therefore easy to decry as unnecessary, wasteful, and inappropriate. Better still, depth can be characterised as something other than depth entirely – it can be superficially described as uncertainty, hesitation, arrogance, obstinacy, or inactivity. In fact all of these descriptors may seem entirely justified from the point of view of someone with no interest in depth or appreciation of its value. So long as one is judged by shallow people, one’s pursuit of greater depth will be entirely unappreciated and disparaged. In many fields, shallow people are at an advantage. Why look for greater depth than is required to convince one’s peers? Greater depth will just slow you down, and when it comes to selling oneself, creating an image, or making an impression: qui prior est tempore potior est jure. ‘He who is earlier in time is stronger in law’. I alone am still, without visible sign, like a new born baby yet to smile, all listless, like one with no home. I alone appear bereft; I, with the mind of a dolt, so slow. I alone am obstinate, uncouth. I alone wish to be different from others, and value feeding from the mother. He does his best to put it into practice. He is in two minds about it. He laughs loudly at it. If he did not laugh, it would not be worth the name of Tao. What is sheerest white looks blurred. The “power” that stands firmest looks flimsy. The Great From is without shape. For Tao is hidden and nameless. Yet Tao alone supports all things and brings them to fulfillment.